Warlord have used it in the battlefield, And used by only high rank the busho. __Momoyama ~ Edo era. SAMURAI art etc__. It was made from a bow by It has been thought that God dwelled in a bow. Bow is the talisman against evil. Yoroi or kimono for children was dedicated to busho and Shogun family as a tribute. 2/ Zunari kabuto with maetate (maetate design is moon & sword). 3/ Suji kabuto. 4/ Suji kabuto with maetate (maetate design is san & kuwa). Nyoi (stick which monks use). Used by only high rank the busho. __ Edo era. SAMURAI art etc__. Design : Dragon. Rare Japanese antique a staff. With marked & a makie box. I appreciate your understanding. Used by only very high rank the busho. Mask parts of yoroi. With tare. __ Edo era. samurai art __. Iron & Japanese lacquer. Material: Iron(Japanese lacquer). Easy to fight because the other party look better. With HANDACHI Koshirae Edo. Koshirae Length Koshirae is good. Blade Length Material Blade is forge Iron(TAMAHAGANE). Condition Blade is Roughing a little scratch. SAYA Length: 26.1. 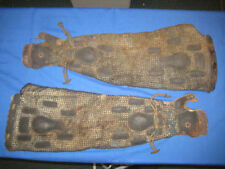 Weight 900 g.
DESCRIPTION This is a Antique ' Iron throat protector(chain mail) 'menpo. Menpo is a defense tool of the face protection. The state is very good. It is a very beautiful hand made work. It is a type of work that requires much time. SIZE 15cm×10cm×10.2cm (5.9inch×3.93inch×4.01inch) total weight: 195g Condition: used / There are a rusting, dirt, and deterioration because it is an old thing. Rare Japanese antique big gold makie tray for busho or daimyo etc. With markd. Used by only high rank the busho or daimyo. Gold makie (Japanese lacquer & gold leaf on wood). Materia l: wood & makie (Japanese lacquer & gold leaf). And this is the really old and serious HORAGAI that the specialist made. MATERIAL : Conch shell. About SAMURAI goods. So, the real item about SAMURAI is very important item familiar with Japanese culture. Rare Japanese antique gold nashiji inro (case). with netsuke. Makie inro case. Netsuke : shellfish. __Momoyama ~ Edo era. SAMURAI art__. a legendary land where an immortal sennin ( hermit) or god is said to live. SUKASHI Carving MUROMACHI. SUKASHI Carving. Age MUROMACHI. Signature MASAMUNE. without stand. Condition There are rust But no noticeable scratch. (2) SAL :About 1 ～ 3 weeks. SAKIKASANE: 1.18. Used by only very high rank the busho. 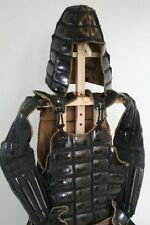 Rare Japanese Antique ”One set of the Iron YOROI”. a complete set of Yoroi. Not kabuto. 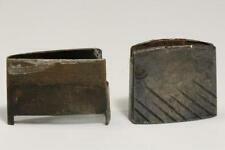 All yoroi parts : Iron & Japanese lacquer & cloth, etc. __Momoyama ~ Edo era. The box for storing a yoroi. The Box which can be used for storing yoroi but also for displaying them in an attractive manner. There are damades. Not yoroi. Other : Not yoroi. __Azuchi momoyama ~ Edo era. 3 Japanese manchira for repair. Manchira (Inner wear in the armor for the battle). Manchira: cloth. Decoration parts for the Yoroi (armor). Parts for attach. __Samurai art __. Neck protector. Wear under the armor. / Parts of YOROI. Rare Japanese antique iron kusari-katabira kabuto. __Momoyama ~ Edo era. SAMURAI art__. I can send all over the world. (Only countries that import permit of the item). The class which displays in a museum. __ Edo era. samurai art __. Rare Japanese antique a Paper lantern. The Chochin. Material: Wood & Paper, Iron, etc. I appreciate your understanding. I am sorry to trouble you, but I appreciate your support. Type: Used by only very high rank the busho. Mask parts of yoroi. With tare. Iron & Japanese lacquer. Material: Iron(Japanese lacquer) 18 cm = 7.0866 in. 25 cm = 9.8425 in. 35 cm = 13.7795 in. I appreciate your understanding. Signature KATUMITU. Koshirae Length Age MUROMACHI. Koshirae is good. HABAKI is Copper Gold plate stretetch. without stand. Condition Blade is ilttle scratch. (2) SAL :About 1 ～ 3 weeks. See side by side photo comparison. Notice the original is dirty and dicoloured due to age. The pattern is water and scrub resistant. One of the most popular patterns of Egawa samurai leather. Size　Koshirae size. Tsuba Center hole. SAYA in side depth. Other without stand. Fuchi,Kashira set is SHAKUDOU Gold painting. (3) Small size SAL :About 1 ～ 3 weeks. (2) SAL :About 1 ～ 3 weeks. Material Tsuba is SHAKUDOU Gold painting. Without stand. Condition Blade is good. (2) SAL :About 1 ～ 3 weeks. IK-93-20190418-899 . NIOI, BOUSHI Deflection is good. SAKIKASANE: 1.1. This is a Japanese MAETATE. This is old original. It is never imitation. It is good modeling. About SAMURAI goods. So, the real item about SAMURAI is very important item familiar with Japanese culture. Edo era. samurai art etc -. Front/ Family crest: Maru ni mitsu gashiwa mon(Oak in circle). / Busho who used this crest: Shima clan, Hagiwara cran, Tsuboi cran, Watanabe clan, Makino clan, Yamauchi, clan, Kubota clan, Osada clan,etc. Painting : 源義経 (牛若丸)/ MINAMOTO no Yoshitsune (Ushiwaka maru). - Edo era. samurai art etc -. Attach it to the back of the armor. Silk battle flag. Rare Japanese antique a very big decoration flag. With Koshirae Edo. Koshirae Length Koshirae is good. NIOI, BOUSHI Deflection is good. Blade Length Material Blade is forge Iron TAMAHAGANE. Condition Blade is ilttle rust But no noticeable scratch. "YASUCHIKA sign Tsuba" Edo. Signature Tsuba "YASUCHIKA sign". High Grade Koshirae with. size　Koshirae size. Tsuba Center hole. Material Tsuba is Iron Gold painting. SAYA inside depth Lengh Tsuka inside. Motif:Kato KIYOMASA. 19th century. Doll Height: about 375mm. Country of origin : Japan. from Japan. We don't declare the low value or mark as "gifts". Size　Koshirae size. Material Tsuba is forge Iron SUKASHI TAKABORI Gold painting. (3) Small size SAL :About 1 ～ 3 weeks. (2) SAL :About 1 ～ 3 weeks. IE-41-20181229-1300 . Other without stand. Condition good. High Grade SANGU (KOTE,HAIDATE,SUNEATE) set of YOROI. SUNEATE size. HAIDATE size. size KOTE size. Weight 3.2 kg. Condition good. (3) Small size SAL :About 1 ～ 3 weeks. (2) SAL :About 1 ～ 3 weeks. MAETATE is Brass. Height 6.69 17. without stand. size　Length 13.5 34.5. (2) SAL :About 1 ～ 3 weeks. (3) Small size SAL :About 1 ～ 3 weeks. IC-29-20181116-999 . Koshirae Length Weight 700 g (with bag). (2) SAL :About 1 ～ 3 weeks. ID-33-20190417-899 . Other without stand. NIOI, BOUCHI Deflection is good. But no noticeable scratch. Condition Blade is old sharpen.